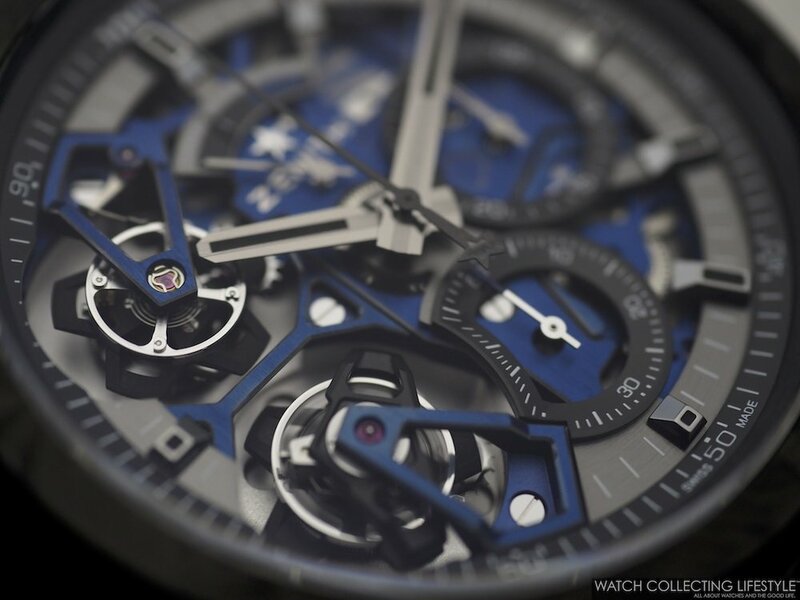 One of the nicest watches we’ve seen this year at Baselworld 2019 and a feat of horology thanks to its 1/100th chronograph and its double tourbillon. The new Zenith DEFY Double Tourbillon is not your conventional watch from Zenith. After the revival of the DEFY line with a case design more in line with the historical DEFY watches from the sixties and seventies, the DEFY watches bring a breath of fresh air to a brand that has revolved around the El Primero look for most of his modern history since 1969. While the case of the DEFY might not be everyone’s cup of tea, here at WCL we do like it. With its angled lugs and modern design somewhat ‘Hublotesque’ looking, the DEFY is a very sporty and sophisticated looking Zenith, the strays away from the classic and more elegant look of the El Primero Chronomaster or Elite collections. The new Zenith DEFY Double Tourbillon features a carbon case measuring 46 mm in diameter and an openworked dial with blue anodized briges. The watch is delivered on a black rubber strap with blue rubber ‘cordura effect’ with titanium double folding clasp with carbon. The layout of the dial maximizes the visual symphony orchestrated by the two escapements and the two balance wheels. The watch features a central chronograph hand that makes one turn each second —1/100th of a second—, a 30-minute chrono counter at 3 o'clock, a 60-second counter at 6 o'clock and a power-reserve indication for the chronograph at 12 o'clock. The impressive Zenith DEFY Double Tourbillon is powered by the El Primero 9020 automatic calibre. This complex movement composed of 311 parts combines a 1/100th of a second chronograph mechanism with a double tourbillon and two escapements, one for the watch itself and one for the chronograph. While one escapement makes the balance beat at a frequency of 36,000 vph, the other makes it beat at 10 times the frequency of the first escapement at 360,000 vph. The movement provides a power reserve of 50 hours when fully wound and the gorgeous blue anodized movement is visible via the display case back. The movement also features an oscillating weight in the shape of a star honoring the El Primero movement. On the wrist, the new Zenith DEFY Double Tourbillon wears true to its size but extremely light due to its carbon construction. A great looking watch that capitalizes on the prowess and long expertise of the brand making exceptional chronographs since 1969. Modern, cool and avant-garde are some of the adjectives that come to mind when thinking about this new watch. This watch is available in a limited edition of only 50 pieces. Sticker Price CHF 119,900 —approximately $120,000 USD. For more info on Zenith click here.